← Can we get clear about free speech? 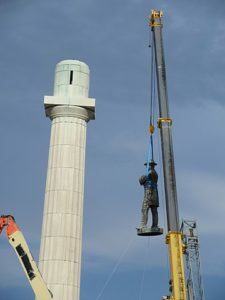 Lately, barely a day goes by that doesn’t have a news story about the removal or destruction of a Civil War historical monument or the unearthing of the graves of Confederate soldiers. The destruction extends to historical figures such as Christopher Columbus as well. 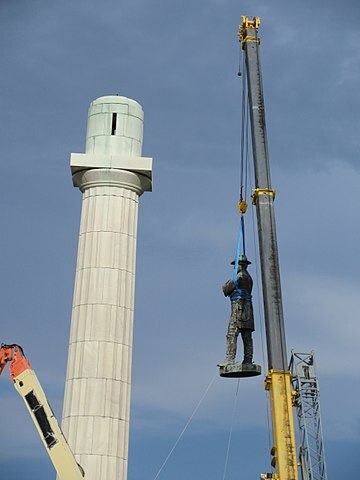 Who knows what historical monuments will be the next to fall into disfavor? There seems to be a feeling among those so engaged that the monuments themselves have the power to harm and so must be destroyed. Moves are being made to censor older films such as Gone with the Wind, as though banning the film is a step toward fixing contemporary man’s problems in life. But if we are going to ban it, let’s just ban all films, since future generations seem likely to take offense at things we believe now. In fact, there are plenty of contemporary films that offend us right now, so let’s give them all the heave-ho! The statues, monuments, graves, and older books and films are simply snapshots of history. And the problem with history is that it is the story of sinners. We perhaps forget this essential element. Because of the human condition, all the history of all nations and people groups is tainted with sin. There are none righteous, after all. No man but Jesus is pure enough to stand above everyone else and set all this right. It appears today that we are selectively singling out only one group of sinners, when there are so many individuals and groups of sinners we could spotlight. But what would be the point? We already know that even the best people are seriously flawed. It seems to us these statue removers have a different agenda than merely pointing out that people are sinners. But whatever their true motives, it is certainly tearing apart our already frayed national fabric. As for Nazis, we’re against them, of course! In 1978, a group of vile neo-Nazis wanted to march in Skokie, Illinois, a Chicago suburb that is home to many American Jews. We were young at the time, and couldn’t understand why Nazis should be allowed to march in Skokie or anywhere else in America! But the ACLU assured everyone that free speech was so important that even the Nazi’s hateful speech and protests had to be tolerated. The ACLU, as well as most liberals at the time, of which I (Joy) was one, often said they would defend to the death people’s right to free speech, no matter how much they personally disagreed with it. But that small group of Nazis never did march through Skokie, choosing instead to stage a rally at another location in downtown Chicago. There was no violence that we can remember, but today violence is becoming commonplace everywhere that Antifa – the supposed “anti-fascists” – appear. Today’s supposed “anti-fascists” look a lot like regular old fascists, when it comes right down to it. Rather than being called “anti-fascists,” they should perhaps be called the “other fascists,” or just “fascists” for short. Auschwitz Concentration Camp has been preserved as a monument to consummate evil. Joy and Neither of us have been there but we understand from some who have visited that it is quite a moving experience. I (Don) have been to the Holocaust Museum in Israel, and the monuments and images are gripping. These historical markers tell the story of remarkable evil and at the same time tell of the incredible heroism and sacrifice in the face of that evil. Hitler’s hatred was motivated by the Nazi belief in the racial superiority of the German people. But when we peel back this rotten orange, we find that this deep-rooted evil did not originate with the Nazis. The Third Reich was acting on the accepted science of the day. They were implementing Social Darwinism through the practice of Eugenics. Following this script, the Nazis began the holocaust by “eliminating” the physically and mentally “unfit” segments of society. They simply hauled off the handicapped (“useless eaters,” as they saw them) to hospitals, and sometime later the families were notified that their loved ones had died. Some never made it to institutions but were picked up and gassed in vans full of these poor souls. When the Nazis received little resistance to their “scientific” gene-pool improvement program, they moved on to eliminating the inferior races (as they saw them) among them. They were merely helping evolution…taking undesirables out of the gene pool. Mankind needed a solution! Eugenics provided the answer! The intent was to weed out and breed out the “less evolved” members of the human species. For Germany that meant Jews, gypsies, and devout Christians. For Sanger it was Blacks and other racial, political and social undesirables that she sought to get rid of. A statue of Sanger is on display at the Smithsonian. We can look back and readily see the great evil that was perpetrated in the name of science in Second World War Germany, but we can also find great deeds of heroism, sometimes from very unlikely sources. Oskar Schindler, about whom the film Schindler’s List was made, is a great example. In the early days of the war, his goal was to become rich, and he was quite willing to do so at the expense of the Jews. As the war progressed, however, he came to see his Jewish workers as human beings, and he ended up expending every penny he had made to rescue as many as possible from the tragic end that awaited them in Auschwitz. In the end, he saved 1,200 lives. These primarily Huguenot (Protestant) Christians risked their lives to save between 3,000 and 5,000 Jews. Monuments not only tell the history of sinners but also show us the history of heroes. It would indeed be tragic to wipe out the memorials that remind us of the evils we are capable of and the compassion we can exercise.